Celebrate Veterans Day in a US National Park — for Free! November 11th is Veterans Day in the US, and the National Park Service will again honor veterans by offering everyone free admission to more than 400 national park units that day! There are quite a few fee-free days each year, providing great opportunities to explore your national parks for FREE! Wondering what’s happening in national park units near you? Use the NPS search engine to find out about special events in your area. You may have read our National Parks – America’s Best Idea post, or you may have seen our link to the national parks we’ve visited, or you may have just noticed that we have a lot of posts about national parks. It’s because we have a goal: to visit all 59 US National Parks. We’re making progress, too: we’ve visited 45 so far! Every park we’ve been to is spectacular, and we’re sure you won’t be disappointed if you visit one. And you can’t really go wrong with free entry! Welcome to Zion NP, #39! Welcome to Badlands National Park, #41 on our list! Wind Cave National Park. Park #40 for us! Black Canyon NP, our 43rd! Some of the ones left on our list are easily accessible, like Shenandoah and Great Smoky Mountains. But we also have four backcountry parks in Alaska that are going to take a little more effort (and a little more cash!) to get to. But we’re going to do it! Here are the parks we haven’t yet visited: Big Bend, Carlsbad Caverns, Congaree, Gates of the Arctic, Great Smoky Mountains, Guadalupe Mountains, Hot Springs, Isle Royale, Katmai, Kobuk Valley, Lake Clark, Pinnacles (the newest national park! ), Shenandoah, and Voyageurs. We highly recommend setting travel goals for yourself and your family. Goals get you motivated and give you a focus. It’s fun to plan and make steps toward a goal as well, and goal setting and taking the steps to complete a goal are great lessons for kids. One of our travel goals is to visit Carlsbad Caverns, Guadalupe Mountains, and Big Bend next spring — our airline tickets are already booked! We realize that setting a goal to visit all 59 national parks might be a little too much for some people, but you can start small. Maybe you could set a goal to visit one new place each year, or to try a new kind of vacation: maybe a home exchange or a camping trip. Or maybe your goal could be to accumulate enough frequent flyer miles to take a trip to your dream destination in five years. Once you’ve got your goal, start taking the steps to make your goals a reality. If you’ve already got a goal, evaluate how well you’re doing on getting there! And please, share your goals in the comments section. 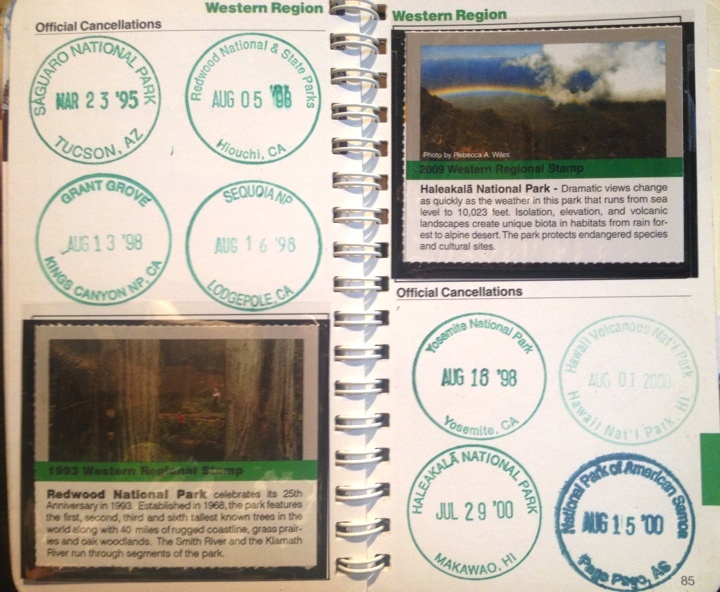 Our passport to the national parks! We hope you get a chance to get out and enjoy a week or a weekend — or just a fee-free day — in one of your national parks soon!